Juan Pablo Caffa celebrates a first half, free kick goal in Thursday’s 3-1 win over Vancouver. 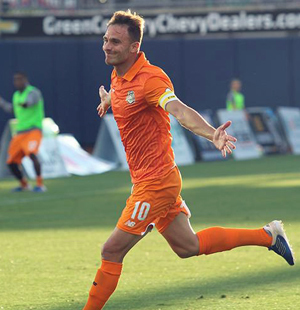 TULSA, OK—The skies were stormy over ONEOK Field on Thursday night and it was the Tulsa Roughnecks FC that made it rain goals as they handed the Vancouver Whitecaps 2 a 3-1 defeat in front of 3,128 at their home grounds in downtown Tulsa. The combined efforts of Juan Pablo Caffa and Ian Svantesson provided all the scoring punch for the Roughnecks, as Svantesson provided two goals and Juan Caffa the other in what was a recovery game after a 3-0 stunner of a loss in Colorado Springs a week ago. The Roughnecks took the game right at the Whitecaps as early as the opening minute of the first half, producing two very good, but scoreless chances. Then, in the 27th minute, Caffa tucked the ball under the crossbar of the Vancouver goal on a 23-yard free kick to give the home side a one-nil lead. In the 40th minute, Ian Svantesson used his head, literally to give the Roughnecks a two goal advantage before halftime when he nodded home a goal off of a lovely cross from Caffa on the left side. Vancouver cut the lead in half three minutes after the break when Gloire Amanda snatched up a Tulsa turnover about 35 yards out, maneuvered through the Roughnecks defenders and punched home an unassisted goal. Svantesson got a second goal in the 53’ when he converted a Joey Callistri right-side cross on the half-volley to give him a “brace” for the match (two goals), and tilting the pitch that much steeper for Vancouver to climb up. The visitors almost managed to take back a goal from the Roughnecks late in the match, but the defense held and the home side walked away with their third win of the season and three crucial points in the USL west. In addition, it brought the Roughnecks to an even-3-3 on the young season. Tulsa head coach David Vaudreuil was pleased with his clubs performance after the match. 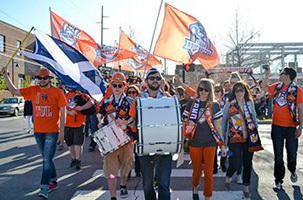 The Roughnecks supporters known as the Roustabouts march to ONEOK Field from a rally on Guthrie Green. Juan Pablo Caffa gave his thoughts on his one goal, one assist performance that included the free kick goal that opened the scoring for Tulsa. Next up for the Roughnecks is a Saturday night match with Orange County SC, and Coach Vaudreuil has some personnel choices to make. Kickoff for Saturday’s match is set for 7pm at ONEOK Field. This entry was posted in Sports on May 12, 2017 by admin.